At some point during parenthood, we all have come face to face with a bedtime staller. If you haven't yet, trust me, you will. Now my kids don't usually flat out ask for an extra five minutes, they just really, REALLY procrastinate the bedtime routine. This one has to use the bathroom one more time. The other one has to say goodnight to the dog. Yet another one forgot to put on his slipper socks. Then the youngest one suddenly just NEEDS to wash his hands. Again. The majority of the time, you'll find me in the upstairs hallway during this mayhem repeatedly saying "hurry up and get in bed." But now Netflix has given me a really great idea that already has worked so much better. Now I can tell them that if they get everything done quickly and get in bed, they can watch an entire show on Netflix. Now wait a minute, I don't want me kid to watch a 30 minute show right before bed! Well neither do I and that is why I love that Netflix and Dreamworks put together these 5-minute episodes of their hit show Dinotrux. What type of bedtime staller is your child? 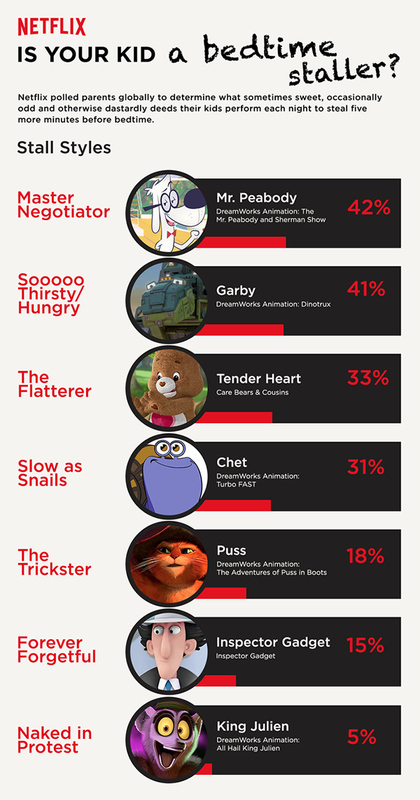 Netflix put together a list of various types of stallers and I find it quite humoruos that each one of my kids fits into a different category. The six year old is always Soooo Thirsty, one of the twins (8) is Slow as Snails while the other is Master Negotiator and the ten year old is The Flatterer.